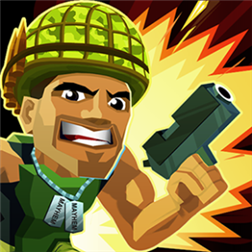 Now available for Windows Phone is the action side scrolling player is the mega hit, Major Mayhem by the folks over at Rocket Jump and Adult Swim Games. The game features high paced stylized arcade shooting as well as the running and gunning you would expect from any game with the given title “Major Mayhem”. Check out the trailer and download below! He’s got an itchy trigger finger, some scratchy stubble, and a fondness for shooting dudes in the face. Run and gun your way through gorgeous 3D environments as you embark on a mission to rescue your kidnapped girlfriend from the Forces of Evil. Guns, grenades and an assortment of other tools of destruction are at your disposal, and you’ll need every last one of ‘em. So what are you waiting for, Major Mayhem? The future of the Free World — and your love life — hangs in the balance. 100 Achievements to earn and collect! 150 Mission objectives (mini achievements). For extended gameplay. 20 different weapons to unleash hell with! Heaps of costumes and hats for the Major. DOWNLOAD the title below for FREE! Written by: MBGW on August 13, 2014.